Ireland currently have a squad depth we’ve never known before, which will result in some tough calls in choosing the 31 players who go to the world cup. Joe Schmidt has a lot of decisions to make regarding the final selection, and no matter what, some good players are going to be left at home. The warm-ups are providing players a final chance to prove themselves, and the hope is the coach will have to make these tight positional calls based on merit, and not have the calls made for him because of an injury, as was unfortunately the case with Tommy O’Donnell. There’s healthy competition for places in each position, but the back five stands out as particularly difficult positions to call. Some players are perhaps pencilled in already. Robbie Henshaw and Jared Payne were Schmidt’s preferred centre partnership in the six nations, and that will likely continue. Rob Kearney and Tommy Bowe have been stables of the squad for some time now, so they may not have to sweat about their places. After that, it gets a little harder to call. Gordon D’Arcy is experienced but has dropped out of the squad in recent times, since the retirement of Brian O’Driscoll. Andrew Trimble and Luke Fitzgerald have been electric for Ireland in their latest caps, but they’ve both been very injury prone. Having to send someone home during the pool stages could break the flow at training camp. Felix Jones was the second choice fullback for the entire six nations and is clearly a player Schmidt is fond of, but that’s his only position, while others are more versatile. Fergus McFadden is extremely versatile but has failed to lock down a starting place, or even a place on the bench. Keith Earls has amazing acceleration from a standing start but has fallen out of the squad since the last world cup. And then there’s Craig Gilroy, Dave Kearney and Darren Cave, talented players with only a handful of caps who just can’t seem to overtake those ahead of them. It’s an incredibly healthy but extremely frustrating situation to be in because there does not seem to be a wrong call here. When we find out who has not made the cut I have no doubt that we will be able make an argument for how they could have contributed. All talented players who have a case to be there. Of course, there’s also Simon Zebo. You could call it the X-factor, that something special, or simply ‘it’. He has this quality that stands out about him. It’s not just his pace, or his timing. Zebos inclusion in the team brings with it the potential for a solo moment of magic in a game. Remember what Bryan Habana did to Leinster in extra time of the European Champions Cup Semi-Final. He intercepted a loose pass ran half the pitch and touched down, to ultimately give the game to Toulon. It may seem like he was simply in the right place at the right time, until you reason that this is Bryan Habana and he has been doing this kind of thing for years now. Simon Zebo has that same kind of spark. Since he scored that hatrick for Munster against Northampton in 2012 he seemed earmarked for a successful Ireland career. Like all finishers he has a knack for being in the right place at the right time, just like he was for his two tries in the recent warm ups. For a winger pace is crucial, and he has buckets of it. He also has a tendency to do something that you have to stand up and applaud, like his pass to set up Felix Jones try against Wales, or that flick in Cardiff in 2013. There was also his vision for his run-half-the-pitch-try against Racing in 2012 and his well-read try against Australia in the last Autumn international. These are not flukes or one-offs; these are moments that show a special player. These are solo moments of greatness. Any great solo player comes with a warning label in a team sport. What’s best for the team is above anything else, and there is a fear that flair players may go for personal glory and try a miracle play rather than go through the phases and do what’s best for the team while possibly staying off the score sheet themselves. That has not been the case so far with Zebo. Ireland had six different try scorers in the 2015 Six Nations as well as penalty try, if we add in the Autumn internationals there have been thirteen different try scorers for Ireland in eight games. It’s true that during those Autumn games the squad was rotated, but it is also reflective of the fact that the only ego in this squad is in the team. That’s down to two key things. The first is outstanding on field leadership. Paul O’Connell captained the squad magnificently in the Six Nations and is set to do so again. Jamie Heaslip is more than ready to step up when O’Connell steps down and has grown into an outstanding captain. We have leaders all over the pitch, and I would happily run through them all if I knew enough superlatives. Every time an experienced player goes off someone else steps up, over the past year the Ireland squad has developed into a team of captains. The second reason for the ego being in the team is Joe Schmidt. Schmidts shown during his time with Leinster and Ireland he will accommodate for beautifully played rugby and winning ugly, whichever is going to bring success on the day. He’s always given the impression that he is picking his team based on current performance and a particular matches game plan, rather than reputation. If everyone knows they are not above being dropped it raises the intensity and ensures everyone steps up. This kind of environment leaves no room for cockiness. That is exactly why Zebo’s flair can and should be inserted into the squad. We have the substance, now we need the style. We have the grit, now we need the class. Zebo was dropped for the deciding game in the Six Nations and took it on the chin, despite arguably playing better than Bowe. He was only on the bench against Wales and when he came on he inserted himself seamlessly into the team and stuck to the game plan. There is no arrogance about his flair, just excellence. In a team that can build phase after phase of attacking rugby, we need that spark who provides something different, Zebo is that spark. To win the world cup we will need to beat a Southern Hemisphere heavyweight, to do that we need more than determination, we need the raw skill and finesse which the All Blacks, Springboks, and Wallabies have an abundance of in their back lines. 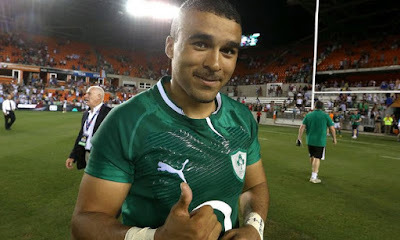 This is a talented Ireland team and as I said before there or not a lot of wrong options among the contenders, but there is an option that stands out, and there will come a stage in a crucial match where it’s just not going our way and we need something different, that is exactly what Zebo can provide us with. We are a team that love a driving maul and superb ball carriers, as we should because it’s worked for us. But sometimes we need another option. After building through phases slowly and sending our ball carriers battering through the oppositions defence, we could use that bit of flair at the end of a move to finish it off. In a squad of talented players like the one we have now it takes a lot to standout. But that is what Zebo has managed to do. He has a quality that you can’t quite put a word to, and that is exactly why Simon Zebo needs to be on the plane.